It's hard to drive straight when your wheels are crooked. If your car is steering you wrong, get on the straight path by driving to Davis Repair. By providing auto alignment repair, we make your driving smoother and help you get the most wear out of your tires. The bottom portion of your car’s chassis (the frame) also includes the suspension system. When the section near your car's wheels is damaged, the steering may become misaligned. 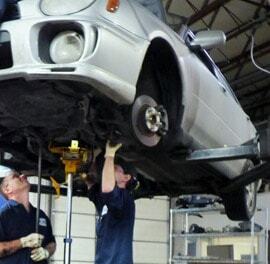 Our ASE-certified team provides chassis repair in order to correct any steering and alignment problems. We adjust everything correctly (the caster, chamber, and toe) to ensure your ride is smooth and steady again. Is your car bent out of shape? Even the slightest problem with your car’s chassis will cause noticeable steering problems on the road. For comprehensive chassis alignment, allow us to set things straight. By measuring and adjusting wheel angles as well as re-straightening bent components, we eliminate problems that create a shaky ride. Greenwood Village, Englewood, Denver Tech Center, Meridian, and Inverness, Colorado.